A lot of college kids get approached at the end of term to donate their books to Better World Books. 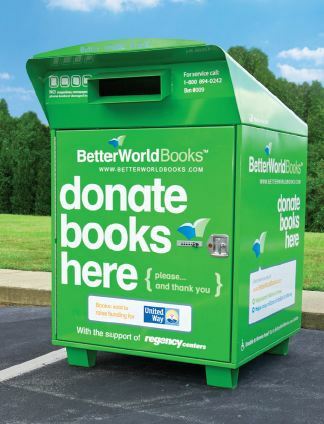 BWB collection boxes are also placed in various locations out in the community and they on-sell these books with the tag line "Your purchase benefits world literacy!" But there are some things you should know about Better World Books. They do not send actual books to people in need of them. They are a 'for profit' book reseller operating through their own site, Amazon and Ebay. If you donate a book to this program you should realize that 93% of the net proceeds from the sale of the book do not go to charity. And that is by their own estimate. As BWB is not a charity, independent verification is not easily obtainable. In their defense people often laud them for having good and very cheap books. Well of course they are cheap! They got the books for free, sometimes (often?) from people thinking they were making a charitable donation or giving a book to a kid in Africa. And on top of that, college kids collect the books for BWB, thus providing the company with free labor. This gives them somewhat of an unfair disadvantage over other resellers. While it is quite true that 7% is better than nothing, many people donating books to this company are allowed (arguably encouraged) to misunderstand the nature and function of this company.So if you are talking about a book that would otherwise end up in the landfill, no biggie I guess. If it is a resellable text book worth up to several hundred dollars--that is quite a different story. So if you see a green box like this, consider walking past it to your nearest charity store or literacy charity such as Global Literacy Project or Books for America. Many of these programs will pick up books from your home or business, and as they are charities your donation is tax deductible.